today's Lipstick Love is Lancome L'Absolu Nu Lip Stick 302 Rose Ideal. This Lipstick is sheer with a slight luster. The colour is a deep rosey pink. It is actually the exact colour of my own lips so when applied is just evens out my skintone, and gives a pretty sheen. Applying it is easy as the product glides on with no dragging like some lipsticks can have. It feels incredibly moisturising on, I've actually never tried a lipstick that has that effect before. Normally lipsticks to me just feel like they are sitting on the lips, which is fine because that's what you expect when its a bright colour but this feels like its actually doing some good at the same time. It's hard to explain what I mean but it literally feels like I'm not wearing any product because it is so lightweight and soft. The packaging is really sleek and feels seriously high-end, what I love is that there is two magnets in the base which connect to the lid so that it has that snap back. I love that noise but what's even better, it means no more lipstick all over the inside of another handbag because the lid has fallen off. I'm now admiring the other shades in the range, I would love to try a peach or a red just to see what the formulation is like in another colour. 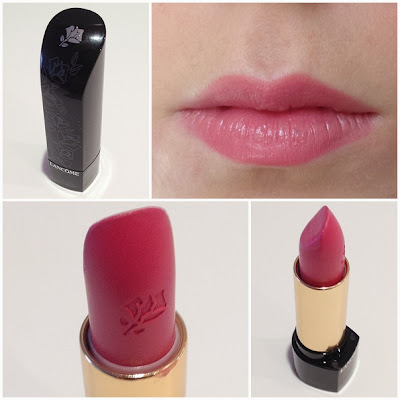 Have you ever tried a Lancome lipstick? Love this subtle shade, looks lovely on you and how cute is the little embossed rose, love it! Never tried the lancome range but I absolutely love this colour! I adore this shade! I've been in the market for a lightweight lipstick for a while, something I can wear every day, and I think you found it for me! Thanks for the review!